We send our best wishes for the holiday season. We hope your year has been happy and healthy. 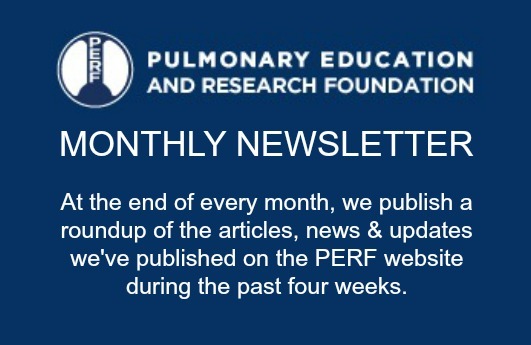 It’s the time of year we try to update you on the goings on at PERF, the Pulmonary Education and Research Foundation. We usually give our research activities as the lead story. This year is different. With Mary Burns and Janos Porszasz pushing the project along, we’ve undertaken a radical updating of our educational activities through our website. Have you been getting our weekly blogs in your inbox? This has been the work of Ann Voorhees Baker, who has taken on the work of overseeing the day-to-day website operations and corralling a series of informational pieces on a wide range of issues related to COPD. Please visit perf2ndwind.org and click on the “join our mailing list” link to sign up for the weekly blog. Or simply click here to join directly. The Rehabilitation Clinical Trials Center is busier than ever. This is the year that Dr. William Stringer joined our group full-time and became Co-Medical Director. Bill is a Pulmonologist and has been Chair of the Department of Medicine at Harbor-UCLA Medical Center for almost 15 years. He stepped down to devote himself more fully to COPD research. He’s taken on a very exciting project. The Rehabilitation Clinical Trials Center is, I believe, the world’s only pulmonary rehabilitation research unit devoted exclusively to research. We’re trying to change this! It is our aim to establish a clinical rehabilitation program that will be offered to the patients at Harbor -UCLA Medical Center and perhaps other hospitals run by the County of Los Angeles. This is not an easy undertaking; Harbor-UCLA is operated by the County of Los Angeles to serve indigent members of the community. Few, if any, hospitals serving an indigent population offer pulmonary rehabilitation services. Dr. Stringer is using his knowledge of hospital operations to work out an agreement. PERF has contributed a patient monitoring system so we can apply state-of-the art exercise training strategies to our participants. We’ve planned an open house on December 11th to celebrate the initiation of this service. I hope you’ll come. Click here for time, location, and other details. The members of our Board of Directors continue to contribute to PERF’s mission. We have two new members since I last wrote. Mary Barnett has been a rehabilitation program coordinator for many years. She has worked with Dr. Brian Tiep to establish innovative programs establishing a continuum of care for COPD patients. Their program is a model for a new-age approach to COPD care. Kurt Antonius comes to us after retiring from a 40-year career in the automobile industry. He is considered a legend in the public relations field, we’re told . We’re pleased to report that neither his retirement nor his COPD diagnosis are slowing him down. We’re sad to report the passing of Dr. Vlady Rozenbaum. Vlady didn’t let his struggle with COPD keep him from being a vocal advocate for COPD patients. His website “COPD Alert” was my go-to source for information about oxygen therapy. Vlady had his hand on the pulse of governmental and industry interaction. He will be missed. We’ve relayed our sympathy to his dear wife (and our long -time friend), Rita. Dr. Harry Rossiter is finishing up his third year as a member of the research group in the Rehabilitation Clinical Trials Center. We’ve harnessed his expertise in muscle biology to try to figure out why the muscles of COPD patients don’t function very well. He’s figured out that, unlike in healthy subjects, fatigue of COPD muscles stems mostly from a limitation in the central nervous system to send signals to the muscles to activate them. This has implications for therapy: it suggests that new therapies to directly target the central nervous system might be of benefit, and informs us of how to better target rehabilitative strategies of the muscles. Harry has also helped us recruit a cadre of very fine trainees; he has taken on the position of Director of Research Training with the group. Alvin Grancell has generously continued to provide support for a research fellow, through the Thomas Petty Visiting Scholar Fund. Dr. Dan Cannon left for a faculty position in San Diego late last year. He was replaced by Dr. Andy Khamoui. We’ve also been pleased to have Dr. Alessandra Adami with us for the past two years; her support comes from a grant from the Swiss government. In the past year, we’ve also had visiting fellows from Brazil, Turkey and mainland China. We’re fulfilling our mission to train the next generation of COPD research professionals. The laboratory continues to interact with industry to help develop new COPD therapies. We continue our work on new bronchodilators; a study just completing is designed to determine whether rehabilitative strategies can be coupled with bronchodilator therapy to enhance everyday activities. We’re also collaborating on studies of new muscle-building drugs. Dr. Janos Porszasz continues to keep our flagship focus, exercise testing, firing on all cylinders. We’ve migrated to a new generation of testing equipment, with the help of a grant from PERF, and incorporated new measurement modalities and strategies. My favorite study, COPDGene, designed to revolutionize the COPD field by discovering the genetic causes of COPD and defining clinically important COPD subtypes, is entering its 8th year. At our site, we’ve had over 350 subjects return for their 5th anniversary visit, with the purpose of determining why some COPD patients’ disease progresses more rapidly than others. In this multicenter, NIH-sponsored trial, over 160 scientific papers have been published. Another very important long-running NIH trial, the Long-Term Oxygen Therapy trial, has recently concluded, though the results have yet to be announced. Mary Burns and Alvin Grancell (who celebrated his 96th birthday recently) remain strong supporters of the research activities in the Rehabilitation Clinical Trials Center, donating money through PERF to support our research. Several pieces of equipment have enabled innovative studies to be designed. Seed funding for research projects has yielded important results and, in some cases, has attracted larger grants. I need to acknowledge the two special people who have been with PERF just about from the beginning. We value the assistance we receive from Jean Hughes, our treasurer and Pete Pettler, our legal advisor. They help us to perform our duties as a non-profit corporation and keep us out of trouble. I, myself, am also one of the long-timers with PERF; I’ve served as President for 22 years. My dear wife, Mary, keeps urging me to slow down, but it hasn’t happened yet. I was thrilled to receive the “Pioneer of Pulmonary Rehabilitation” award from the Pulmonary Rehabilitation Assembly of the American Thoracic Society last May. I’ve found interesting work on national and international projects. In recent years, I’ve been contributor to major pulmonary rehabilitation, exercise science and COPD guidelines panels. I’ve been appointed as member of the Board of Directors of the COPD Foundation, a national “patient-powered” organization and serve on their scientific advisory council. I am participating in an effort to widen the perspective of the Food and Drug Administration as they consider new COPD therapies. This is the part of the letter where we ask for your support. This is our annual appeal; the only time you will be solicited. Our overhead is very low. I can assure you that your donation will be used efficiently to promote research and education in the fields of rehabilitation and COPD. We know how to squeeze every last cent out of your dollars! All of our Board members contribute their services. Your donations are fully tax deductible and will be gratefully acknowledged in writing. We hope to hear from you. Please click here to donate, or you may send a check made payable to the Pulmonary Education Research Foundation, to P.O.Box 1133, Lomita, California 90717-5133. We are deeply grateful for your contribution, no matter what amount. Flu Season Again! How Can You Tell If It’s The Flu Or Just A Cough?